Jax and the club try to find Bobby as he's being head by Moses Cartwright. Cartwright sends word that he wants the location of the body left on Pope property, the written statement and the mother and son or else he will cut off another of Bobby's body parts every 24 hours. When they realize that Gibbs was actually Jury's biological son, Jax requests a meeting with him. When confronted, Jury admits that he wants Jax dead but he swears he never ratted him out to the Chinese. 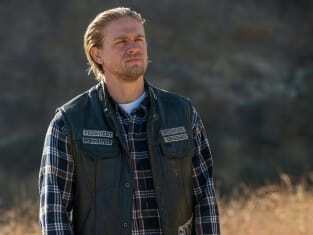 Jax doesn't believe him and when the two fight, Jax shoots Jury dead on Sons of Anarchy Season 7 Episode 8. Jury's vice president is outraged that Jax killed a club president without calling a vote. Juice makes a deal with the DA to point the finger at Lin's men for Tara's murder and to tell them where they can find the murder weapon. Unser figures out that Juice plans to kill Lin for Jax so that he's allowed back into the club but he feels as though there's a piece of the puzzle missing. Abel gets sent home from school for hitting another boy with a metal lunch box and someone breaks into the house, kills Gemma's birds and leaves a message on the wall. No Son Is Safe. When Jax attempts to negotiate with Moses Cartwright, he ends up being sent another box. Watch Sons of Anarchy online right here at TV Fanatic.